Ford has manufactured reliable automobiles for decades, and it hasn't fallen short with the Ford Taurus. 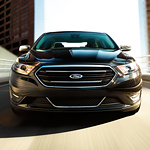 Here at West Herr Ford of Amherst, we want to help you understand all that the Ford Taurus has to offer, such as technology features that are innovative and convenient. The Taurus comes with the SYNC 3 infotainment system. This system offers Android Auto and Apple CarPlay, which makes it easy to access apps and music from your smart phone. Other perks that come with this infotainment system are available navigation, voice recognition, and Ford+Alexa. With Ford+Alexa, you have access to Amazon Prime, traffic information, and the ability to control Smart Home devices from within the Taurus. The vehicle also offers forward collision with brake support. This feature monitors for potential frontal collisions and will provide you with a visual alert if one is detected. In addition, this feature can also increase brake sensitivity to help prevent a forward collision.